Answering the tech practicalities of the modern executive from a design focused perspective, our Small Mount Street Laptop Bag is a business essential. Designed to carry a charger pack and boasting an abundance of pockets and cable paths, it is ideal for carrying laptops, tablets and phones on the go. Each bag is handmade from exquisite Italian calf leather; the generous interior lined in luxe grosgrain. 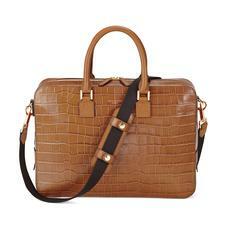 A choice of shoulder strap or sturdy handles speaks to the versatility of this striking bag. Combining fashion and functionality, our Small Mount Street Laptop Bag is designed to stylishly hold documents and technology. Handmade from the finest Italian calf leather, the semi-structured soft design has a capacious interior lined in shimmering grosgrain, with a single large main compartment and a full length padded section for your laptop or tablet (capacity to fit up to a 15" laptop). Carry this impressive business bag by the dual tubular top handles or detachable shoulder strap for ultimate versatility. Finished with Italian-made signature hardware, Swiss made zips and the Aspinal logo and branding echoed on the decorative rivets and zip pull. All business bags arrive in an Aspinal protective felt bag.